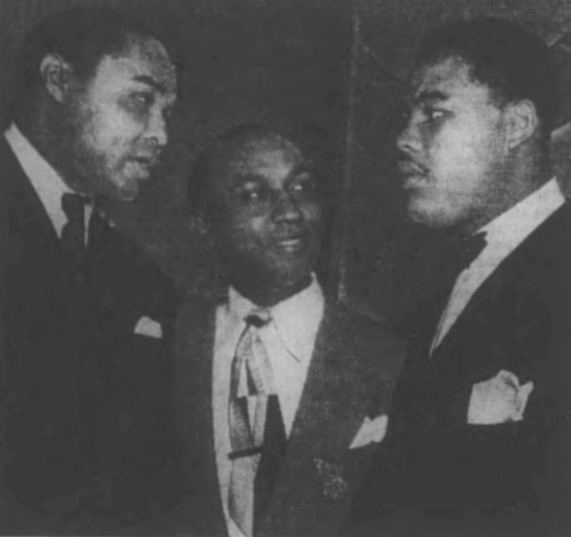 Don't Fight, Fellows seems to be the plea of quartet maestro Doles Dickens as he sandwiches himself between Henry Armstrong and Joe Louis. Actually Joe is congratulating Henry on his new Melody Room in Harlem where Dickens' outstanding quartet is currently featured. Armstrong's Melody Room opened two weeks ago with rival restaurateur Joe Louis on hand. Doles Dickens formerly played bass and sang with the Phil Moore Four and only recently organized his own outfit which is already the talk of the town.